This week I read Cormac McCarthy's Child of God, and Shakespeare's Titus Andronicus. The first is about a necrophiliac serial killer, the second about revenge carried out with unbelievable violence upon the families of a foppish emperor and his iron-willed general. Earlier I read Garcia Marquez' Autumn of the Patriarch, in which a general cooks and serves his enemies at a banquet. And I also thought of this story from the Washington Post. If Cormac McCarthy or Gabriel Garcia Marquez put this President and that Iraqi corpse together in a novel, nobody would believe it. Caligula lives again and his name is Bush. I realize this post is out of character for this blog. The persona of Dove is indeed a complete fiction, a performance I am no longer willing to act non-stop. So sue me. Guess I ought to close up shop, according to Mr. McCarthy. 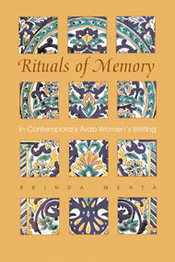 The distinguished scholar Brinda Mehta, professor of French and Francophone studies at Mills College, just published this book: Rituals of Memory in Contemporary Arab Womens Writing, Syracuse University Press. This volume carefully assesses fixed notions of Arab womanhood by exploring the complexities of Arab women’s lives as portrayed in literature. Encompassing women writers and critics from Arab, French, and English traditions, it forges a transnational Arab feminist consciousness. Brinda Mehta examines the significance of memory rituals in women’s writings, such as the importance of water and purification rites in Islam and how these play out in the women’s space of the hammam (Turkish bath). Mehta shows how sensory experiences connect Arab women to their past. Specific chapters raise awareness of the experiences of Palestinian women in exile and under occupation, Bedouin and desert rituals, and women’s views on conflict in Iraq and Lebanon, and the compatibility between Islam and feminism. At once provocative and enlightening, this work is a groundbreaking addition to the timely field of modern Arab women’s writing and criticism and Arab literary studies. Brinda was recently awarded the Frantz Fanon Prize for Caribbean Studies for her book, Diasporic Dis(locations): Indo-Caribbean Women Writers Negotiate the "Kala Pani." Mills is lucky to have her in the classroom, where she is a beloved teacher as well as award-winning scholar. You must read this graphic novel in progress by the talented young Lebanese artist Joumana Medlej. History of the character and many more images available here. Miss Medlej is an illustrator and artist living in Beirut. Note that she is co-author on a lovely children's book in French about the sea turtle. You may buy her sea turtle images - tee shirts and coffee mugs and even prints - at Cafe Press. Miss Medlej has roots in the village of Lbaa, very close to my own village, Mieh-Mieh. I only know of her through her website and her postings on the Lebanese blog aggregator; but the village priest in her home town is my cousin's brother-in-law. That's Lebanon for you - Miss Medlej has written about this - everybody in the country is only two degrees of separation from each other. I am delighted to discover the rich, mythic, layered work of this exuberantly talented artist, and I think her work deserves an audience in the USA and Europe as well as Lebanon. Saed Muhssin, Randa Jarrar, Mohja Kahf, Laila Lalami and Daniel Alarcón are all reading or performing somewhere in the next week, and they're all friends or teachers of mine. Daniel is the only non-Arab in this list but he's got the soul of an Arab so he's getting a mention. Saed Muhssin, Arabic and Contemporary Music: Graduate Recital. experimental/ free improv/pan idiomatic music, improvised and composed, solo and ensemble. Mohja Kahf and Randa Jarrar will read at the Stanford Bookstore on Tuesday, May 1, at 5:30 PM. Mohja is a fabulous poet and fiction writer who teaches comparative literature at U. Arkansas; Randa is a dynamic fiction writer with many story publications and a forthcoming novel. Mohja Kahf is also reading at the Arab Cultural Center in San Francisco on Monday night, April 30, 6:30 p.m. See Mohja's books at left: the poetry collection Emails from Scheherazad and the debut novel Girl in a Tangerine Headscarf. Laila Lalami, our own Moorish Girl, is returning from Morocco to sit on three panels at the Pen/Global Voices festival in New York City -- one on Wednesday 4/25 and two on Thursday 4/26. One of the Thursday panels is with Abdulrazak Gurnah. The other is with Pico Iyer and Neil Gaiman so it's a celebrity blow-out. Check her blog for details. Laila is the author of the novel about Moroccan immigrants titled Hope and Other Dangerous Pursuits. Daniel Alarcón is covered with glory this week - a Guggenheim to him announced Monday. He deserves it. Catch him at the Tishman auditorium in NYC Tuesday April 24, 8:30 pm, as part of the Granta Best Young Novelists panel. Then look for him on two more panels on the 27th, Friday, as part of the Pen Global Voices festival. Check his site for more specifics. Mr. Alarcón is leaving soon for a tour of the Middle East sponsored by the US government. He will be visiting Syria and Palestine as well as Israel and Turkey. If you have a chance to meet him or hear him read, take it. His new book, Lost City Radio, is gripping and heartrending, set in a city that resembles Lima, Peru. He is one young American literary star the Arab world would do well to read. See also his collection of stories: War By Candlelight. The economist Brad DeLong, in a post about The New Republic, asked the world to construct examples of negative probability. Negative probability is for "things that are so unlikely that their happening would overturn the entire structure of the universe." Single payer health insurance becomes the law of the USA and all the health insurers have to restructure their businesses to compensate. The government decides to enforce the statutes on broadcast licenses and the public good to include political campaigns. All broadcast and cable companies must devote large amounts of airtime to free, public service campaign coverage, including debates and town hall meetings. Since the airwaves are licensed by the government for the public good, broadcasters must provide free airtime for this purpose. Fundraising is no longer the main focus of a politician's life. Political ads on TV disappear. Lobbyists lose leverage. Democracy gains. California builds a high-speed rail service between San Francisco and L.A., starting in 2009. The US government quits spending money on military bases across the world and plows all the cash saved into rebuilding the light rail systems torn out of American cities sixty years ago. Just like France, the government starts subsidizing daycare, whether private or non-profit, so that all children may go to pre-school; just like France, pediatricians make well-child visits to all pre-schools and elementary schools to deliver vaccinations and give regular check-ups, since these services are paid for by the government. Mothers no longer have to take off from work to get their kids to the doctor. Housing and Urban Development gets funding to build enough low and moderate-income housing to meet the need. The government lends working people the money for mortgages, cutting banks out of the sub-prime business. Oh yeah, American CEOs suddenly realize that earning 400 times the average worker's wage is bad for the health of the country, and they all voluntarily start taking salaries at multiples equivalent to those of Japanese or West German CEOs. Or maybe just roll back the multiples to the level of 1980, or a staggering 40 times the average worker's wage. For bonus points: Israel decides to obey all international laws, pulls out of the West Bank and Gaza completely, tells the settlers to come back to '67 borders or take their chances as citizens of Palestine. Then Israel realizes that they have to do better, and they make one state and give the vote to everybody within the borders of Israel/Palestine. The Palestinians start rebuilding and work out their factional differences. The Lebanese resolve their standoff and become a one-person, one-vote society with non-sectarian parties and parliament seats. Syria figures out how to have a democracy without getting pulverized by US bombs. Bashar Assad runs for office and is bested by a coalition of progressives who promise to quit meddling in Lebanese affairs. The Americans stop subsidizing and supporting dictatorships like Egypt and Saudi Arabia, and pressure these countries to open their electoral systems and practice true representative democracy with no cheating. Every country quits torturing. America apologizes for Iraq and shuts down Guantanamo. All the assaults on the US Constitution of the last seven years are rolled back. America bans handguns and automatic weapons. Americans turn in all their weapons not used in hunting and get refunds for their trouble. The gun factories close down. A massive Marshall plan to rebuild local industry across America employs huge numbers of people who had not been counted as unemployed because they long ago quit trying to get work. The economy blossoms, and oil consumption drops because we're not importing so much crap. Middle-class Americans decide to return to their public schools en masse, especially in the cities, and the government responds by funding new classrooms and teachers, bringing the student teacher ratio down to 18:1. Learning ensues. Feel free to add your favorite improbable but devoutly to be hoped-for possibilities. Positive messages, please. So many of my readers are atheists and yet I persist in posting phrases that allude to my belief in a Power Greater Than My Puny Self. I realize the theist beliefs I hold are not provable by scientific method, and must make some of my readers squirm. Still, I am absolutely committed to secularism, separation between religion(s) and state, and tolerance of all manner of spiritual belief. Today I read something by a non-believer that touched me, and I post it in the spirit of equal time for all manner of belief: Daily Kos: Dinesh D'Souza says I don't exist: an atheist at Virginia Tech. We atheists do not believe in gods, or angels, or demons, or souls that endure, or a meeting place after all is said and done where more can be said and done and the point of it all revealed. We don’t believe in the possibility of redemption after our lives, but the necessity of compassion in our lives. We believe in people, in their joys and pains, in their good ideas and their wit and wisdom. We believe in human rights and dignity, and we know what it is for those to be trampled on by brutes and vandals. We may believe that the universe is pitilessly indifferent but we know that friends and strangers alike most certainly are not. We despise atrocity, not because a god tells us that it is wrong, but because if not massacre then nothing could be wrong. I am to be found on the drillfield with a candle in my hand. “Amazing Grace” is a beautiful song, and I can sing it for its beauty and its peacefulness. I don’t believe in any god, but I do believe in those people who have struggled through pain and found beauty and peace in their religion. I am not at odds with them any more than I am at odds with Americans when we sing the “Star-Spangled Banner” just because I am not American. I can sing “Lean on Me” and chant for the Hokies in just the same way and for just the same reason. I do happen to think it's entirely possible that there are angels, dead souls, and a sort of meeting place where we get to debrief over what just happened; but I could very well be delusional, and I am not eager to put my belief to the test. The list of things in which I do not believe would have gotten me burned at the stake in several European countries of not so long ago. Thank goodness for Thomas Jefferson, who made sure that the Constitution protects the right of all of us to have whatever beliefs or non-beliefs we choose about the Deity(ies) and attendant religions. 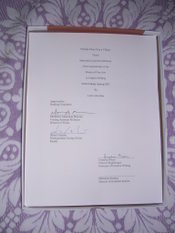 I am proud to announce the completion of my thesis for the Master of Fine Arts in Creative Writing. Title: Perhaps There Was a Village. Reading Committee: Micheline Aharonian Marcom, Thesis Director; Daniel Alarcón, Reader; Cornelia Nixon, Chair of English Department, Mills College. I am resting happily at home tonight. More later. Just stop war: Lebanese artist building bridges to peace - Yahoo! News. In the process, the film-maker and former war reporter has made a statement not only against 30 years of violence in her native Lebanon, but against conflicts everywhere. Her installation, Strange Games Bridges, opened for the first time last month at the National Museum of Singapore and is on display until April 22. "It's taken from my life experience in Beirut but it could be any war in the world," Saab told AFP in an interview at the museum. She said she had tried to forget about war, but last year's conflict "brought back all my pain". What an inspiration. I think I'll log off now and write a story. The list of the dead at Tech includes at least two (so far) Arabic names: Reema Samaha and Ross Alameddine. Another Arab-American, Jamal Albarghouti, survived the attack and has been seen in the media discussing the celphone video he took of some of the shooting. UPDATE: The Lebanese foreign ministry confirms that Samaha and Alameddine are of Lebanese ancestry. A new name added to the list, Waleed Shalaan, seems as if it could be Arab, as well. My profound condolences to the Samaha and Alameddine families, and to all the other people mourning their dead in Virginia today. My father arrived at Virginia Tech in 1957 as a foreign student from Lebanon. He went there to get a masters' degree - and VPI was cheaper than the other schools he got into - see Cal Tech. Looking at the list of the Virginia Tech dead, and the interviews with survivors, I notice several Middle Eastern names just for a start. There are also immigrants from all the rest of the world, including the Romanian Holocaust survivor who died protecting his students. People who hate immigrants will of course use this tragedy as an excuse to bash immigration, but Virginia Tech has a long tradition of welcoming foreign students, and including many who are permanent residents or naturalized citizens. You would have to find boxcars and send out battalions of troops to purge Virginia Tech of the non-native-born, and then you would still be left with the children of immigrants, people like me with funny names who maybe have an immigrant father. To get rid of all of them, you would have to purge people like Barack Obama. And you would have to decide which immigrants' children you're going to purge - Irish? Mexicans? English? Indians? Oh yes, and how about all the professors who are naturalized citizens, or children of naturalized citizens with attendant "funny names"? I have a friend on the faculty at Virginia Tech who is an Arab-American, born here; his father, like mine, graduated from Virginia Tech. Shall we get rid of him, too? Probably a quarter of the faculty at most American colleges would have to leave. And would such ethnic cleansing prevent future gun massacres? Not bloody likely. Just saying. The logic of immigrant student goes crazy = get rid of immigrants really doesn't hold up. My thanks to Blue Girl for linking to me, and welcome to those of you who found me via Kevin Drum. Yes, they are talking: Israeli and Palestinian Leaders Open Regular Peace Talks - New York Times. May they keep talking and deal honestly with each other. May America do the right thing and support justice. The Dove has become quite despairing and cynical and hopeless about her government's motives, ethics and powers. BUT. They are indeed talking and that must be recognized.